Around the time that the Trump administration’s Section 232 tariffs on steel and aluminum were implemented last year, U.S. Commerce Secretary Wilbur Ross noted the administration’s goal of lifting steel and aluminum capacity to 80% (the level reflecting a healthy industry). Following the implementation of the tariffs, that figure gradually increased as domestic producers got a boost, with some even announcing smelter restarts (U.S. Steel’s Granite City steelworks being a prime example). So, how have production levels fared to start the new year? According to data released by the American Iron and Steel Institute (AISI), the steel capacity utilization rate through Jan. 12 reached 79.5%, up from the 73.6% posted during the same period in 2018. Production in the year through Jan. 12 reached 3,231,000 net tons, according to the AISI report. Meanwhile, for the week ending Jan. 12, capacity utilization hit 79.8%, with 1,891,000 net tons of steel produced in the week. Production for the week marked a 10.2% increase from the same week in 2018. In addition, production was up 0.8% in the week ending Jan. 12 compared with the previous week. 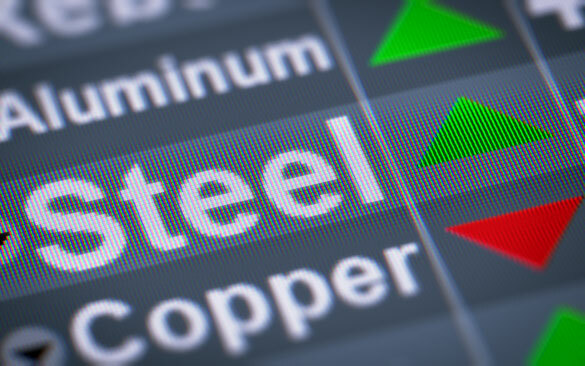 U.S. steel prices across the board have seen their price momentum evaporate in recent months after hitting more than seven-year highs in 2018, buoyed by the Section 232 tariff. For instance, the U.S. HRC three-month price was $905 per short ton as of June 1, 2018. On Jan. 14, that price was $687 per short ton. As MetalMiner’s Irene Martinez Canorea noted in her recent Raw Steels MMI report, steel prices appear to have entered a downtrend.